In Part 2 of 3 of this blog series we mentioned that you’ve probably heard of the “stages of readiness” for making actual behavior change based on the work of Prochaska & other colleagues. In Part 1 of 3 of this blog series we talked about what to expect from a professional resource and even touched on the subject of health coaching. In Part 1 of 3 of this blog series we also cited an example of a chance encounter we had in the produce section of a supermarket highlighting that timing is everything and how it provided an opportunity to support someone who was ready to make a positive choice for behavior change at the point of purchase. Opportunities for making small changes in life can occur at any time on any day. We also mentioned a simple downloadable pdf with some family stories focusing on “A Year of Being Well” that mention how anyone can implement small changes and have those steps add up in improving the quality of their lives. The family members kept some key points in mind as they engaged in behavior change that made it easier for each of them to be successful. The families cited didn’t let socioeconomic challenges prevent them from reaching goals that were truly important to them, but rather they shared their story of how they made changes in spite of obstacles in their way. Each of them found their “inner hero” just as you can, too. 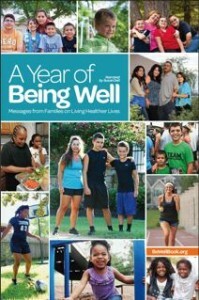 (Image of “A Year of Being Well” property of & courtesy of the Michael and Susan Bell Foundation and shown here for illustrative purposes only). Plan ahead to give yourself some “days off” and realize that often hitting your targets 5-6 out of 7 days each week is actually manageable as it means an approximate 70-85% improvement in your lifestyle over what it was in that behavior area before you made the change(s). Many professionals are eager to convince the public to stop using less healthful approaches of “fad diets” that involve helter-skelter restriction of their food intake for certain periods of time. Those approaches typically lead to dietary imbalance and potential health risk that could result in more harm being done than good. They also focus more on negatives. After all, people would rather hear about what they can do, than what they can’t do. It just makes more sense to focus on positives of behavior change at the fresh start of a new year! You’ll hear various combinations of terms being coined or re-struck. Those combinations include various words being grouped together, such as eat, eating, forgiveness, guilt-free, i, intuitive, intuitively, love, me, mindful, mindfully, peace–you get the picture. These words and more are chosen in various combinations to create a sense of personal involvement, positive change, energizing, empowerment and potentially some level of safety. The advocates of using various combinations of such terms are trying to help the public form a positive mindset and that is a good perspective to have. After all, doesn’t it make more sense to learn better ways of making choices that can have a positive impact on your body and mind, as opposed to jumping from one fad diet to another hoping the “next” one will somehow magically work long term? The words used are also chosen in some instances to create a sense of commitment to one’s self and one’s body. They also focus on the idea of forgiving your past actions, making peace with yourself and what you eat, and moving forward in a positive state of mind and action. Additional classic terms that have also been associated with such efforts include some variation of “system” or “watch” or “zone” and nowadays more typically avoid the word “diet” much of the time, but since diet is simply the way you eat, there really is no logical reason to avoid using the word. Misuse of the word is where any difficulty lies. Just as children don’t like the idea of deprivation, neither do adults. Children like choices and so do adults. We believe in your right of choice. Although change can be sudden, more often than not it is more gradual. Really think through any potential changes you might want to consider embracing in 2013–consider them quite seriously before verbalizing any New Year’s Resolutions. Build upon your past successes, even if that means making a list of those to remind yourself of the good things you have done. You can access the free resource available through the efforts of the Michael and Susan Dell Foundation (think Dell Computers) called A Year of Being Well (Messages from Families on Living Healthier Lives) with an accompanying Discussion Guide that you can download and perhaps share with a group of friends if you would like to help support others and let them help support you in making 2013 one of the best years ever! If you ultimately decide to embrace behavior change this New Year 2013, then don’t hesitate to seek out the level of information and personal support you need. We know if you ask your family & friends that they’ll tell you–you really are worth it and they want you to be as well as you can be, but ultimately any choices you make have to be your’s and not their’s. Talk to your doctor, get the OK to do what is felt to be reasonable for you by both you and your health professional(s), and go for it! Don’t just keep talking around changing any food and nutrition behavior(s)–make 2013 the year you actually do it! P.S. Feel free to check out a classic guest blog post on Success Via Simple Small Steps for some ideas on how implementing small, reasonable changes in succession over time can lead to lasting success! Also still available is the blog post entitled Do You Know How to Build a Better Grocery Shopping List? as well as Provide a Better Fuel Supply for Your Body.